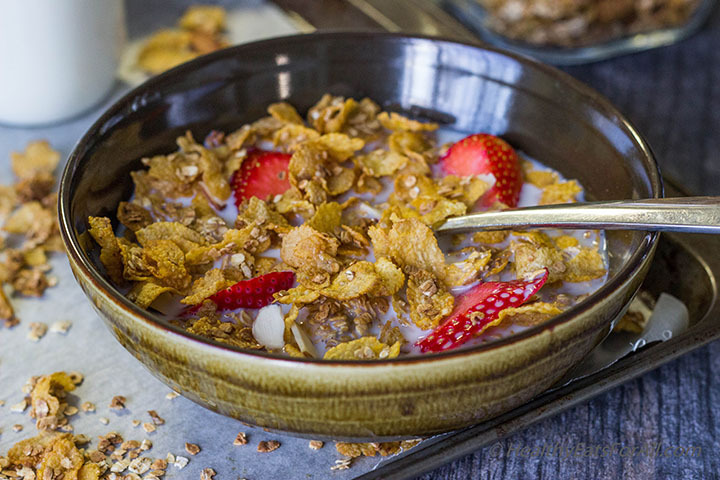 One of the most popular questions that I get asked by friends, family and readers is what to have for breakfast that is quick to make and healthy. Plus some variety in breakfast is needed. Eating the same thing can be really great for some people who don’t want to decide every day, don’t want too many choices and want to keep life simple. That is okay! But people like me crave variety 🙂 One day I’ll be good with something sweet, then next day I want something savory. But there is no question that despite that I also prefer something that is quick to make, healthy and delicious. The best compromise I’ve found is to make in bulk. How much you make in bulk depends upon you. I usually make enough for a week so I just refrigerate it. If you want it to last longer then you will have to freeze part of it in individual portions. But either way a little bit of planning is definitely needed. Some days if you can squeeze out 5-10 minutes in the morning then a smoothie works great for breakfast! 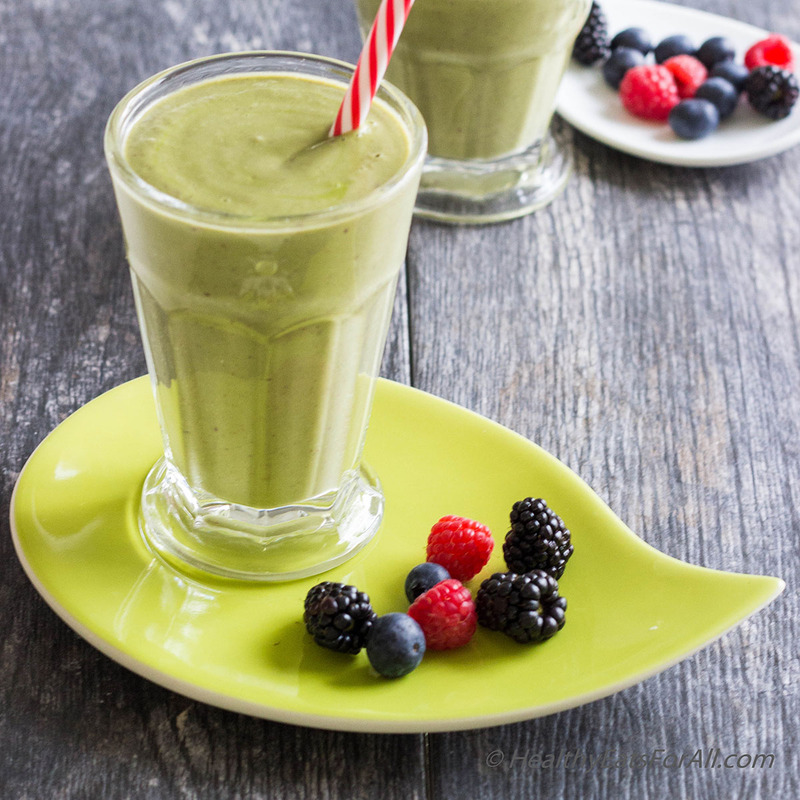 You can try the Mixed Berry Banana Protein Smoothie or the Avocado Berry Smoothie. 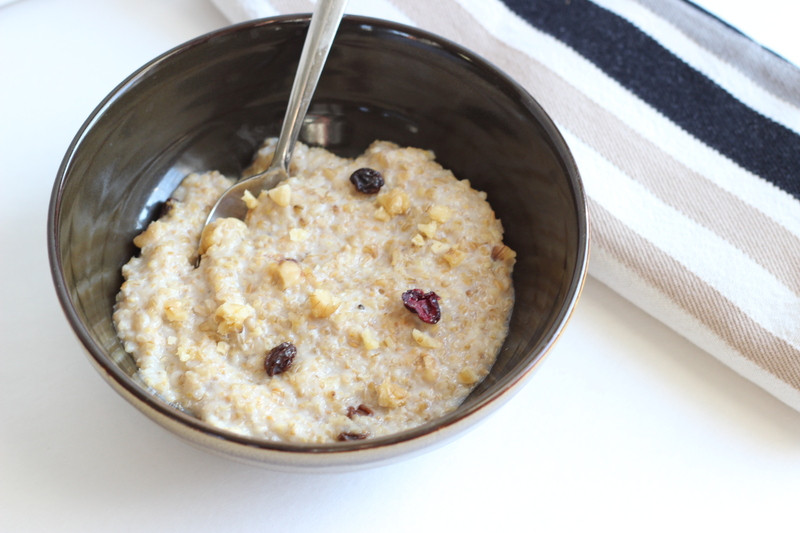 Organic Steel Cut Oatmeal with Flax – This recipe is quite a favorite with me and my husband. Steel cut oats are a fantastic source of complex carbs which will not raise your blood sugar immediately. This has ground flax and nuts in it, making it a great source of fiber, omega 3 and protein. A bowl of this will keep you satisfied for at least 2-3 hours. I usually make it once a week, so I don’t find the need to freeze it. Whenever we have to eat it, we just scoop out a portion, add some milk and microwave for a minute. But if you were to freeze it then it might be convenient to freeze single portions in a muffin pan. Then you can store the frozen oatmeal muffin shapes in a freezer bag. You can then thaw a single oatmeal muffin in a bowl in fridge overnight or just microwave it the next day with milk. 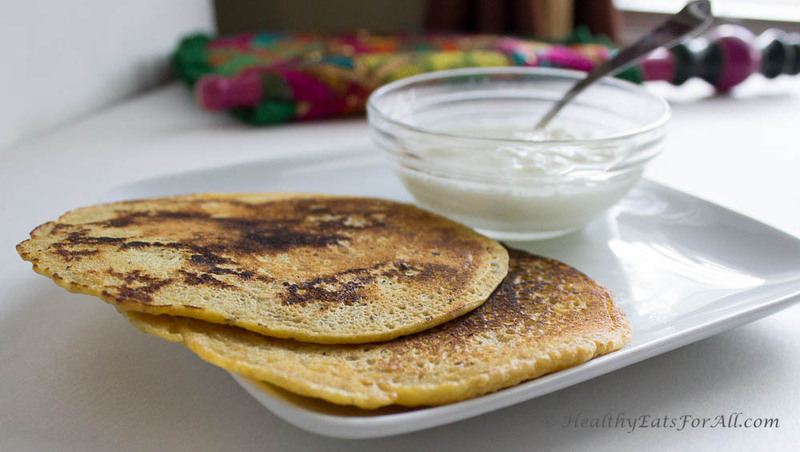 Chickpea Flour savory Pancakes (Besan pooda) – For the days that I crave a savory breakfast that is not an egg, these pancakes fit the bill! It is a great gluten-free breakfast or midday snack choice which not only refrigerates well but freezes well too. They are a great source of fiber and protein. For an extra nutritional boost, I also sometimes grate zucchini and add it to the batter to increase the fiber content even more. In case you eat eggs and want to increase the protein of the pancakes, feel free to add 1-2 eggs to the batter. Whenever I make these, I always make 1 ½ times the recipe, that way I have enough pancakes to last me for a while. I will refrigerate half the quantity and freeze the other half. Before freezing I place a small square of parchment paper in between each pancake so they don’t stick to each other and are easy to take out and microwave. If your day is packed, it only takes a couple of minutes to take out 2-3 of these and microwave to have an excellent portable breakfast on the run! 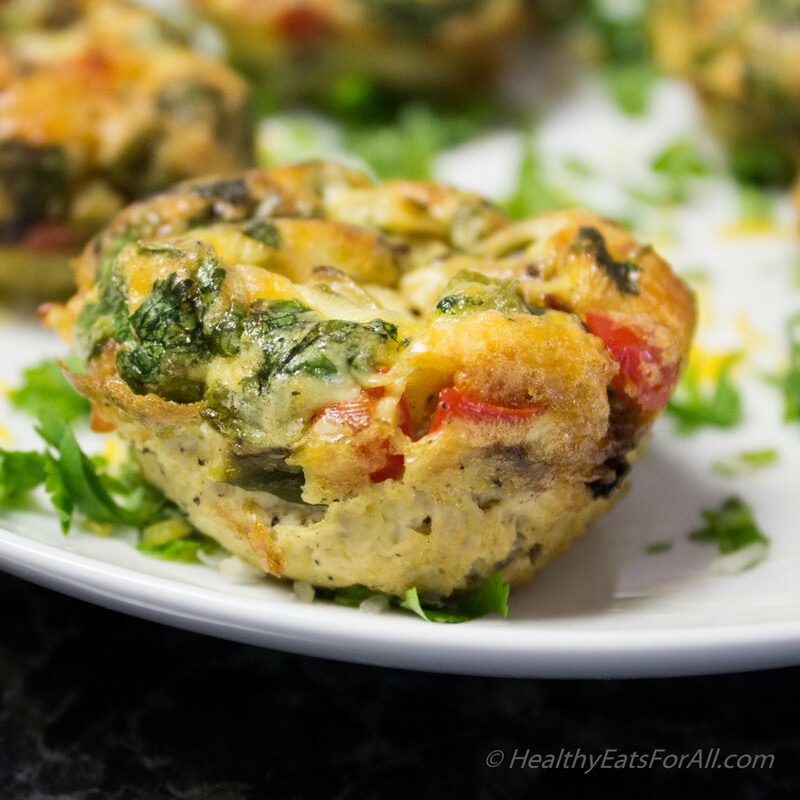 Veggie Frittata Cups – Eggs happen to be the most popular breakfast choice. Not only do eggs provide a great source of protein, but the vegetables in this recipe provide plenty of fiber. Feel free to add some grated cheese for a total comfort food! Again these are fantastic as a portable quick breakfast or as a midday snack. These also refrigerate really well, so I make them for the entire week. Just pop one in the toaster oven for a crisp finish or microwave it if in you are in a rush. 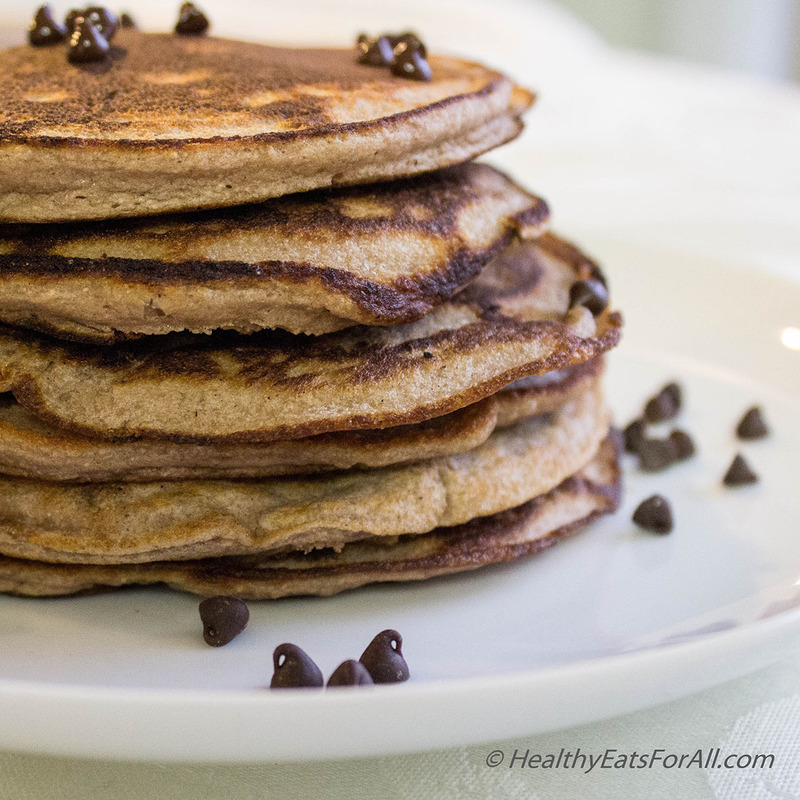 Chocolate Chip Protein Pancakes – Talk about a decadent breakfast! 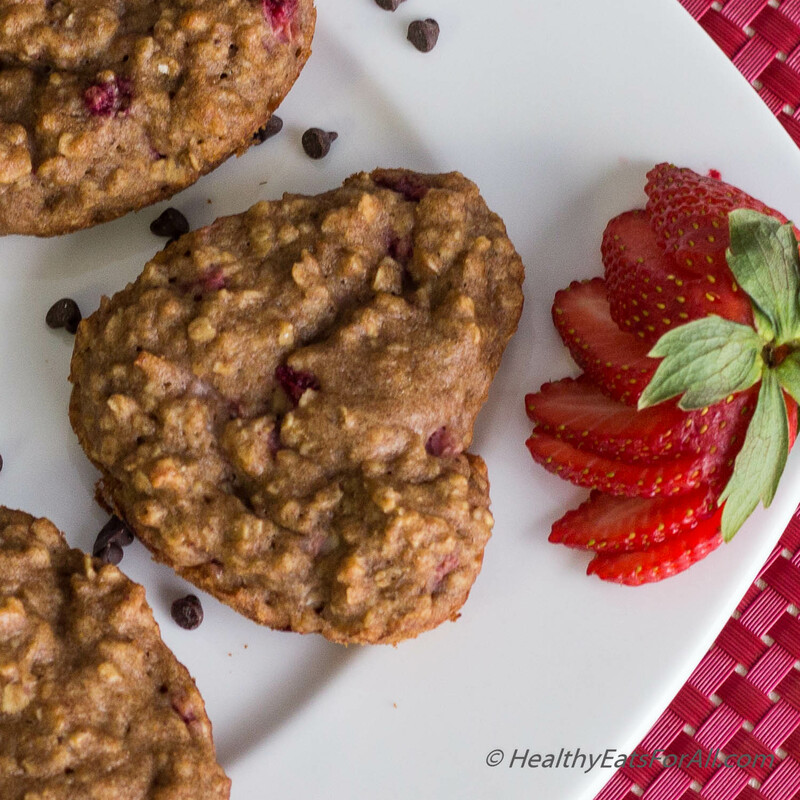 Not only do you get to indulge your sweet tooth but have a great nutritious, protein rich breakfast. Again these refrigerate and freeze really well. I usually end up making 2-3 times the recipe, so that way I can freeze quite a bit. Make sure you keep a piece of parchment paper in between each pancake to stop them from sticking together. They are a breeze to just take out frozen and microwave, leaving you with no excuses to avoid a healthy breakfast. 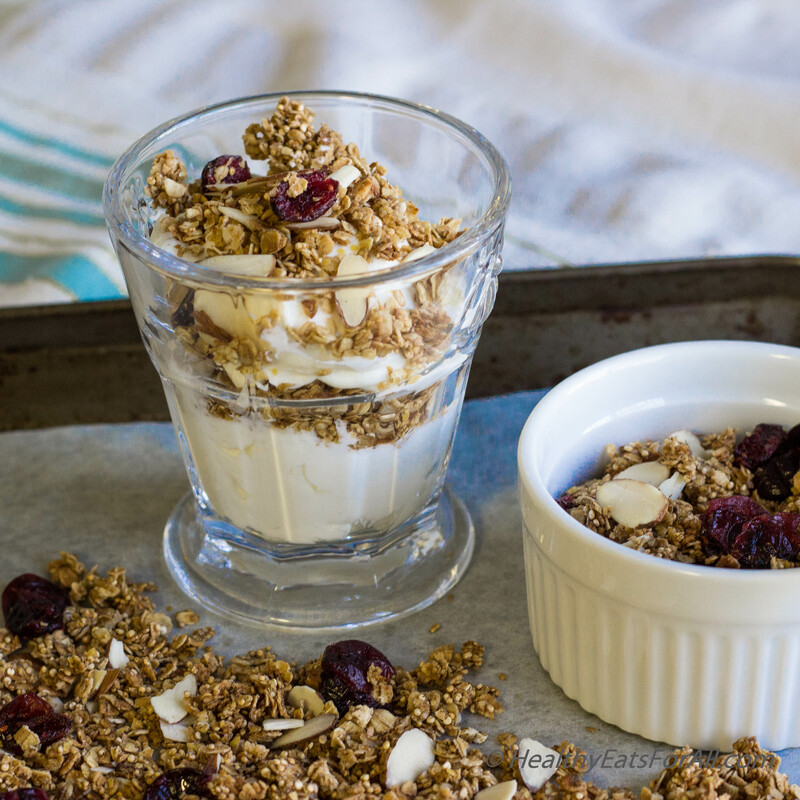 Almond Cranberry Granola and Honey Bunches of Oats Cereal— These are fantastic choices for breakfast or snack-time. You can have them with some Greek Yogurt and fresh fruit or with milk. Both recipes are a great source of protein, especially when combined with Greek yogurt. These are a great low-sugar alternates to their store-bought counterparts. Add some sliced almonds and strawberries or bananas, and you’ll have a fantastic breakfast/snack ready to go! 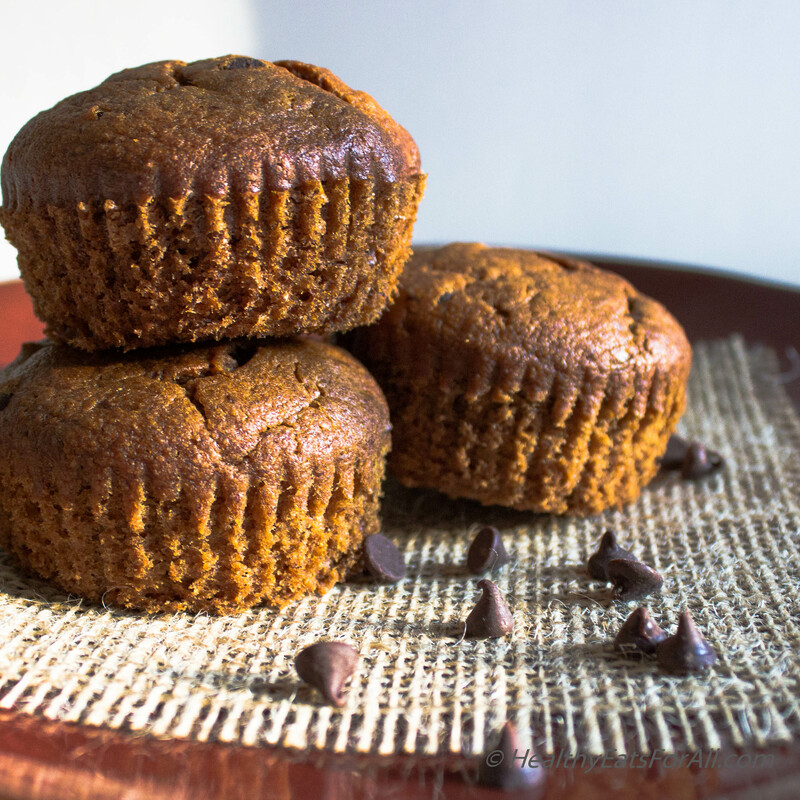 Banana Bread, Carrot Cake and Oat Muffins – Coupled with a cup of tea/coffee, these can be a great breakfast, snack, or dessert! They can be made well in advance and can be stored really well in the fridge. You are welcome 😊 I am glad this was helpful!